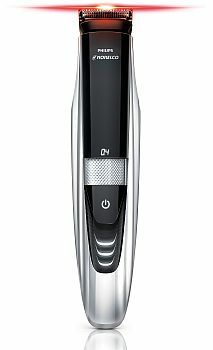 Introducing the very 1st laser guided beard trimmer- Beardtrimmer 9000 (w/ Laser Guide) by Philips Norelco. I’ve tried it at the barbershop and on my very own beard and I must say the the laser guide is a great help! For the guy who finds it difficult to get their beard lines perfect here’s your answer. And to be honest, if you’re a barber or hairstylist, this is a great tool to add to your kit. Especially if beard work isn’t your strong suit. If I was to offer any suggestions on improving this tool, I would make the blades a tad bit closer (in cutting ability). Doing this would give it an even greater ability of handling shorter beards and short curly beards that tend to grow closer to the skin. I think that with this minor tweak, this tool could be a universal game changer! Could you please tell me the dimensions of the beard trimming adjustable comb? Not the cutting depths, but the actual dimensions of the comb(length,width)?